It’s peculiar how ghosts will bump into you when you are least expecting them to. How they’ll blindside you and drag you back to places long since forgotten, or at least places that you convinced yourself that you had forgotten about. 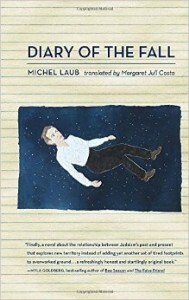 Michel Laub’s devastating and beautiful new novel, Diary of the Fall, is riddled with ghosts. The characters in Diary of the Fall suffer under the endless, ever-changing expanse of recollection. Whether it is the grandfather, an Auschwitz survivor who exists in a world of false memories and idealistic images of the world around him; the father, a man burdened by the crumbling memories of a past not completely his own, yet who remains tethered and bound to its horrible consequences; or the son, now a forty year old man haunted by the ghost of his thirteen year old self and his reprehensible actions towards another less-fortunate student during a birthday party that changed him forever; each character is linked together through the collective identity and experience of what it means to be not only Jewish but also human in a constantly changing world. Oscar Wilde wrote in The Importance of Being Earnest, “Memory…is the diary that we all carry about with us” and in this exploration of three generations of men suffering from the unbearable weight of memory, all three carry quite a heavy load. The narrative unfolds in a disjointed chronological order and is framed as a diary of sorts. The details are not reported with a corresponding day or month, however, but in numbered paragraphs sectioned off and grouped under headings such as Things I know about my Grandfather and Notes (1) and The Fall. By delivering the story in these small, bite-sized pieces, Laub masterfully creates easily digestible portions of unsettling details. The blunt edges of his simple yet effective prose hit the reader with a force that makes you stop and catch your breath before reading on. With each revelation, the prose bruises you and leaves a mark. If at the time, someone had asked me what affected me most deeply, seeing what happened to my classmate or the fact that my grandfather had been imprisoned in Auschwitz, and by ‘affect’ I mean to experience something intensely as palpable and ever present, a memory that doesn’t need to be evoked to appear, I would have had no hesitation in giving my answer. The father, unable to deal with what he reads in these notebooks, clings to the reality of Auschwitz with militant fervor. Diagnosed with Alzheimer’s, he begins to obsessively write his own memoirs—a record of “the way things really are”—and disseminates them to his son to read before his memories explicably escape him. Diary of the Fall leaves our narrator with a simple but often times debilitating choice. It is the same choice that we all are forced to make every day. We must decide if we will allow aspects of our past, and the pasts of those closest to us, to change who we are. What memories will alter our course? Which ghosts do we acknowledge and which ghosts do we ignore? This slow-burn of a novel gives you no choice but to pay attention to the ghost that wraps its arms around you and drags you to the places where guilt, disappointment, and anger dwell, grabbing you hard enough to leave a mark. A mark to remember it by. Chad Meadows’s work has appeared in Crack the Spine Literary Magazine and in The Squawk Back, where he is also the assistant editor.